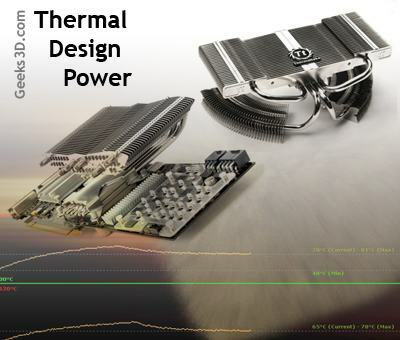 Tutorial: What is the Thermal Design Power (TDP)? This is a value you meet often in CPU or graphics card reviews and tests. The Thermal Design Power or TDP in short, is the maximum power consumed by a device (graphics card for example) under normal / regular use. In other words, the TDP is the max power a device can dissipate when running real applications. What’s more the TDP is given for graphics card default clocks. TDP is a manufacturer’s data and thanks to this value, VGA cooler makers can size their GPU coolers for example. The TDP is not the maximum power consumed by processor. Under some special conditions, the device can consume more power than the TDP. In the world of GPU, this situation occurs when you run an application such as FurMark with an overclocked graphics card. And from some news, the upcoming NVIDIA GT300 GPU will have a TDP of 225 Watts (less than a GTX 280). In place of TDP, you can also find the term Maximum Board Power or Max Power Draw or Power Envelope. How to measure the max power consumption of a graphics card? Is this the average power or peak one…? What happened with the GeForce GTX 280? The TDP is not a peak power but rather the maximum power the device can create (or dissipate) permanently without problem. A peak power is the power dissipated by the device when running a power virus for example. I don’t think that this formula is correct – it doesn’t include the Graphic Card Idle power consumption.